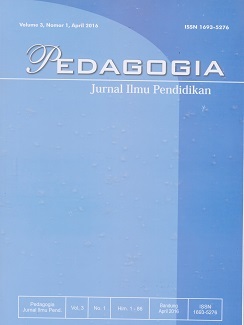 The aim of this Journal is to promote a principled approach to research on PEDAGOGIA concerns by encouraging enquiry into relationship between theoretical and practical studies. The Scope of Journal: 21st century challenge to education: Skills for 21st century (roles and objectives of education), Inclusive education (formal and informal education). Learning assessment, New Learning/Teaching Models, Neuroscience in Education, Creativity in Education, Development of body of knowledge21. 21st-century challenges to teachers’ education: Strengthening Teachers’ Profesional Identity, Teachers’ Development Program, Best Practice of Teacher Education Model, The roles of teachers’ Association, Accreditation system. Current Issues in Education: Guidance and Counseling in Education, Non-Formal and Continuing Education, Special Needs Education, Curriculum and Educational Technology, Quality Assurance/Standards and Accreditation, Educational Management and Leadership, Policy, Legal, and Financial Issues in Education, ICT skills and Digital Literacy, Early Childhood Education, Primary Education. Educational research paradigm in 21st century: New paradigm of educational research, Academic research projects, Research methodologies in education, Linkage between education and research, Collaboration models in educational and research. Educational and Sustainable Development Goals (SDGs)Diversity of Learning, Education and Globalization, Multicultural and Peace Education, Impact of Education on Development, Empowering local wisdom, Ecology Education, Sustainable education. Kindly read these guidelines carefully. Authors who want to submit their manuscript to the editorial office of Pedagogia should obey the writing guidelines. If the manuscript submitted is not appropriate with the guidelines or written in a different format, it will be REJECTED by the editors before further blind-folded review. The editors will accept only the manuscripts which meet the guidelines and formats as assigned.